Opticomm‐EMCORE will unveil its new Genesis XD (GXD) at InfoComm 2014. 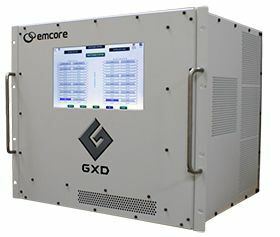 The GXD is an all-in-one multimedia matrix solution that converts, scales, switches, and distributes video, audio, and data for small-to-large connectivity applications. The Opticomm-EMCORE display at InfoComm will include a four-panel video wall, created using Genesis XD and Genesis-compatible multipoint products, including their new GBOX Series of compact, throw‐down boxes, Optiva system cards, and the new Eclipse HD system. Opticomm‐EMCORE will unveil its new Genesis XD (GXD) at InfoComm 2014. According to Opticomm‐EMCORE, the Genesis XD platform can be utilized in numerous connectivity applications, including the corporate, education, government, and security industries. GXD can support all video, audio and data for multi‐display, high‐security, command and control rooms, as well as distribute ultra‐high resolution interactive video for simulation/mission control applications. For AV/IT integration applications, GXD can bridge both audio/video and data networks over the same IP/Ethernet infrastructure. Genesis XD accepts and converts both analog and digital signals, including HDMI 1.4b with HDCP (now known as HEAC ‐ HDMI, Ethernet, Audio, Control), Display Port, DVI, VGA, Component and 3G HD‐SDI. GXD’s massive 40 Gbps backplane accommodates uncompressed 4K UHD resolutions now and 8K resolutions later, allowing it to serve as a staple for Installers that want a flexible and reliable connectivity platform. Remote locations can be connected via singlemode and multimode Fiber up to 10 kilometers (6 miles), as well as CATx/HDBaseT or IP/Ethernet up to 100 meters (300 feet). A notable feature of Genesis XD is the ability to break‐away and switch audio separately for professional audio editing and processing requirements. Genesis XD also includes interfaces such as USB 2.0 for remote KVM applications, RS‐232 Serial Data and Ethernet for controlling remote devices. The system can be remotely controlled and monitored through any laptop or tablet to access the web‐based GUI. For more information visit Opticomm‐EMCORE at InfoComm 2014, June 18‐20, Booth C7716.